Science is in our name and it's our main game! At Cub Creek Science Camp, science is incorporated into everything we do! We encourage our campers to explore, experiment, ask questions, and try lots of new things. We engage their curiosity and give them opportunities to strengthen their problem solving skills. Campers learn by "doing" and have a whole lot of fun in the process. If you're looking for fun STEM activities for your camper this summer, you're in the right place! Many of our campers come to camp loving science and are excited by things like physics and chemistry. Other campers come because they love animals, arts and crafts, or other activities offered at Cub Creek. What all campers find out, is that science is everywhere! At Cub Creek Science Camp, we believe learning is fun and especially when kids are given the opportunity to investigate their passions. 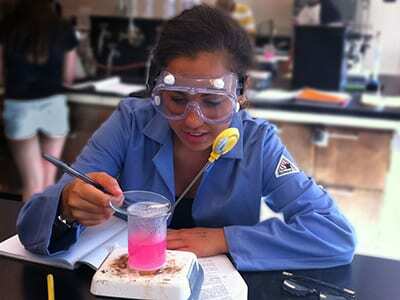 We want campers to realize that being passionate about science is nothing to hide! People have done amazing things with their passions in the hard sciences and animal science. We want our campers to go on and do great things, too! Look below for a list of our Science activities. Chemistry is the science of matter. Chemistry is often called "the central science" because it connects physics with other natural sciences such as geology and biology. 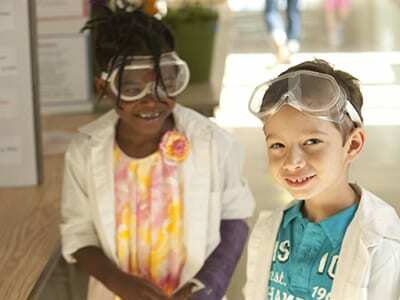 At Cub Creek Science Camp, we love to help grow a camper's passion for Chemistry through fun and engaging activities. Campers can take the Chemistry course for the whole week, or sign up for individual chemistry classes. Into to Chemistry - A class full of mini experiments gets campers thinking and ready for larger concepts coming later in the week. Concepts in surface tension, adhesion, and discussing molecules and bonds spark interest for what is to come this week! 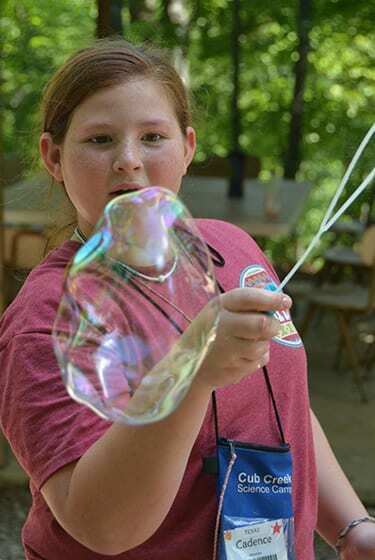 Giant Bubbles - A camp favorite, this class dives into surface tension and light refraction in a fun (and messy!) way. Campers of all ages enjoy creating bubbles and seeing how to and who can make the largest one! Rainbow in a Jar - By layering different liquids of different densities, campers make their own colorful rainbow. Campers talk about what makes a liquid more or less dense than another and see the science in action. Oobleck - What is both a liquid and a solid, while being neither a liquid or a solid? Oobleck, of course! Campers create this Non-Newtonian fluid and/or solid right in their hands! Oobleck is an interesting, messy, and fun way to see Chemistry at work! Flubber - With a few simple ingredients, campers mix up flubber and discuss what makes it hold together. Polymers are the topic of class as campers make bouncy balls and squishy slime! As the group adds more water, they see how much the flubber changes. Why is that? You'll just have to come and see! Physics is a branch of science that studies how and why things work. An understanding of physical principles has allowed mankind to float on water, fly through the air and even land on the moon! In this course campers learn how things work… and why they sometimes don't! Simple Machines - Use lever and pulleys and inclined planes to create some of the oldest machines known to man. Campers will work together to build a pulley system that can hold and (safely) lift one of their friends in a chair! Catapults - With a few simple materials, campers can construct this small ancient machine on their own. They'll then test it by launching some items! Electrical Circuits - Understand circuits by using a circuit building set with lights, motors and fans! Then, campers use their knowledge to build a flashlight with just the needed materials! Electromagnets - See electromagnetism come to life by building a small, simple motor. Campers learn how the interaction between a flow of electrons and a magnetic field creates electric energy! Water Rockets - Campers build rockets and then watch as air pressure launches their creations into the air! This is a popular physics' activity that combines Newton's Third Law of Motion with a fun camp twist! Crime Science is the scientific study of the nature, extent, and causes of criminal behavior. Knowledge of both hard and social sciences help to to successfully uncover mysteries. Combining multiple disciplines gives detectives the tools they need to solve puzzling mysteries. 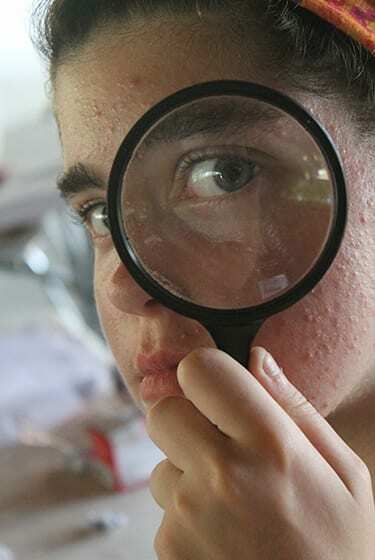 From testing fingerprints to analyzing fake blood, campers will form a detective team to work to gather the evidence to convict your fictional felon. Fingerprinting - Capturing a legible fingerprint may be harder than you think! Campers will learn how to pull fingerprints from different surfaces and then practice rolling each others fingerprints with ink and paper. 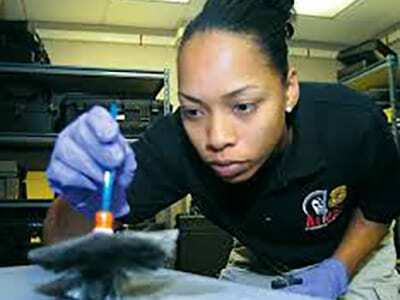 Hair and Fiber Analysis - Can that thread left behind at the crime scene really help solve the crime? Yes! Get up close looks at different fibers and hair types to see what a really small clue could lead to. Tracking and Impressions - When tracking foot prints, bicycle tracks or a blood trail, every clue is important. Campers will learn to evaluate evidence left behind to deduce what may have happened at the scene and where the perpetrator would be next. Blood Basics - Campers learn the basics of blood evidence in this class that teaches about blood types, bloodstain patterns, and how Forensic Scientists test for blood in a crime scene. Things get messy when campers have fun mixing up fake blood! The Trained Eye - We set up a mock crime scene and campers use their skills to assess the scene and determine the next course of action. By the end of the class, the team should have solved the crime, found motive, and captured the perpetrator! For Social Sciences, Ability Awareness is our course geared to help campers understand their own capabilities; and the unique abilities and talents of others. 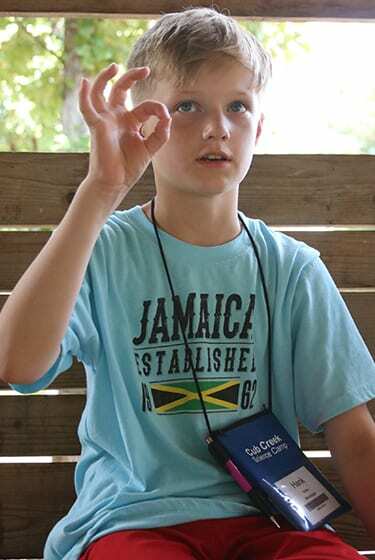 In these classes, campers will learn what life is like without the benefit of all five senses as well as challenges faced for people with different physical abilities. Sign Language - Campers earn to talk using their hands in this class geared to teach them basic American Sign Language (ASL). By the end of the class, campers should be able to spell their names and basic phrases. Advanced campers may even be able to hold a conversation! Fine Motor Challenge - Can you imagine buttoning your shirt wearing mittens or writing without using your thumb? 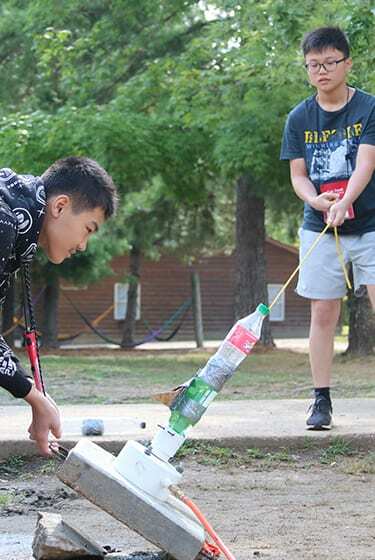 In this class, campers are challenged to try every day tasks with small limiting factors. Trust Walk - Experience what life is like for the visually impaired. Campers will be tested to walk a blindfolded friend through an obstacle course. The blindfolded participant must depend on their other senses to make it through! Wheelchair Obstacle Course - Much more challenging than it looks, campers learn to maneuver in a standard wheelchair through an obstacle course. They will try their best to turn corners, steer, and back up through cones, crates, and other blockages! 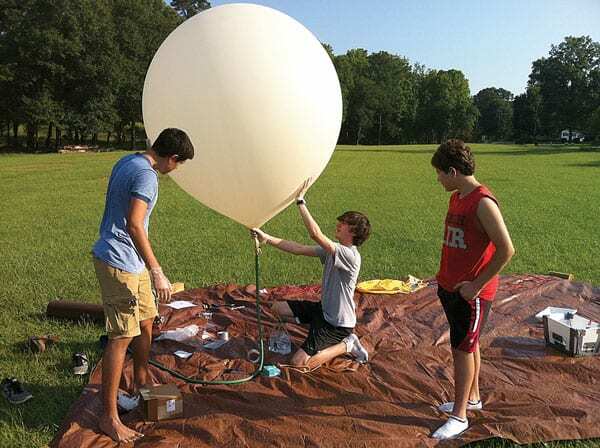 Additional Science Classes range from old camp courses that have become classes to special classes offered based on the interest and experience of our STEM loving staff. The mix of new and familiar science activities are just one more thing that we do to keep the excitement and mystery to each summer at Cub Creek Science Camp. Pool Science - Sometimes offered as a course, Pool Science dives into concepts of physics in the pool! Campers enjoy making clay boats that test buoyancy and Cartesian divers that explore the concepts of how Pressure, Temperature, Gas, and Volume all work together. Elephant Toothpaste - As part of the Chemistry classes, this is a perfect class to explore concepts like exothermic reactions and catalysts. Campers really get the feel how dramatic chemical reactions can be! Escape Room - NEW to Camp! 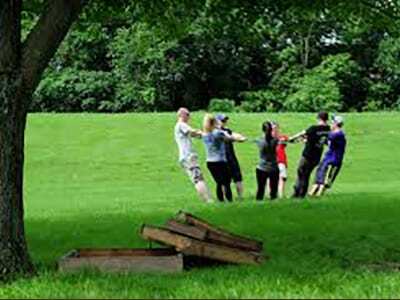 * Campers will work together to solve a series of puzzles and riddles and escape from the room. They'll use STEM principles and reasoning to escape a room in a class period!